Among the western world, freedom is arguably the chief value we seek as democratic societies. Our freedom is what dignifies us as human beings but that evokes the question of what exactly is freedom and whether or not God is a suppressor of freedom. 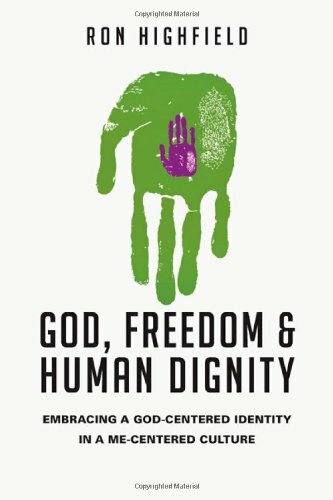 This is the issue that Ron Highfield* addresses in his book God, Freedom & Human Dignity: Embracing A God-Centered Identity In A Me-Centered Culture. Published in 2013 by InterVarsity Press, the book is 227 pages and includes both a subject index and scripture index. Also, to my delight, the book includes footnotes rather than endnotes. The book aims to show why God is the foundation for true freedom and human dignity, whom we can love God and give ourselves to without loss of joy (p. 12). In order to unpack this claim, the author divides the book into two sections. In the first half, the author explores how we, as autonomous individual modern selves, the “Me-Centered” selves, conceive of freedom and view God as an obstacle to freedom. The second half of the book then explores the Christian view of God as the self-giving Father, Son, and Spirit in whom we find our true identity and gain true freedom and dignity to live as the people God has created and redeemed us to be which is a “God-centered” life. The book weaves a tapestry of theological and philosophical voices from into conversation with the biblical story, making a very solid argument for a wider range of readers. In other words, scholars and pastors will appreciate the depth of the book while students and lay people will benefit too because of the book’s accessibility. The book demonstrates how among western culture freedom is an ideal without limitations which we must achieve through our own initiative. The problem with the western notion of freedom is that it requires the removal of every impeding obstacle and therefore satisfaction is never found because there is always another obstacle which we must overcome (p. 103). Though the modern autonomous self regards this illusion as freedom, it always falls short of true freedom. Alternatively, God is the foundation and giver of true freedom, as Highfield demonstrates. This freedom, which is found in Christ, stems from the fact that in Christ, God has set us free from sin and death. This gives us the freedom to live as our true selves, the people whom God has created and redeemed us to be, which mirrors the image of God (p. 189-190). One book can only do so much and will always leave the reader with unanswered questions. Having said that, I wish the book would have explored how this understanding of true freedom finds expression within the church, since the church is the collective new creation of people who belong to God in Christ. Speaking of the church, I also believe that some discussion questions at the end of each chapter would help as well. That’s because this book will make for a very useful small group discussion or even for a “Bible” class to read through. Nevertheless, this book is a great read! It is an easy and engaging read, providing a good overview along with solid theological and cultural engagement on a subject that hits very close to home for many people, including myself. I am thankful to both Ron Highfield and IVP for providing me with a copy of this book. * Ron Highfield, is the Blanche E. Seaver Professor of Religion at Pepperdine University where he teaches classes in systematic theology and Christianity and culture; he also serves as a Shepherd of the University Church of Christ. This entry was posted in Churches of Christ, Contemporary Culture, Theology. Bookmark the permalink. I agree with your suggestion/criticism that for Christianity the church is the place where the Christian vision of freedom can be and must be embodied. The book does not develop this important theme. I hope, however, that it points the way toward such a development. On the need for discussion questions, I have written a study guide to the book with questions for discussion on each chapter. At present, it is posted in 15 installments on my blog. I plan to revise and compile it into one document soon. Thanks for the review! Thanks again for the book. A book can’t do everything and should you have tried addressing how true freedom is embodied in the church, that would have added a considerable amount of pages to the book which might have been counter-productive to writing a book for a broader audience. People, especially “lay people,” tend to shy away from books that are too long.